Urban planners and engineers have long been interested in measuring street connectivity and typically do so with relatively simple measures such as the link to node ratio (called the Beta Index in the Transport Geography field), which divides the total number of links (i.e. road segments between intersections) by the total number of nodes (i.e. intersections including dead ends). In the above image, the connected network has link to node ratio of 1.6 while the dendritic network’s link to node ratio is 1.0 (a link to node ration of 1.4 is typically considered a well-connected street network). The connected node ratio divides the number of connected nodes (i.e. nodes that are not dead ends) by total number of nodes (Handy, Paterson, & Butler, 2003). The networks above have a connected node ratio of 1.0 and 0.6, respectively. The underlying intent is distinguish between well-connected or gridded street networks and dendritic, treelike networks – as highlighted in the figure above – in researching relevant issues such as travel behavior, road safety, VMT, and public health outcomes. Topology takes a slightly different approach to understanding this issue. The Meshedness Coefficient, for instance, measures connectivity by looking at the number of cycles in the network with respect to the maximum number of cycles (a cycle is a closed path that begins and ends at the same node with no fewer than three links). A Meshedness Coefficient of 0 represents full tree structure (i.e. no cycles), and 1 represents complete connectivity (i.e. every node is directly connected to every other node, which is not feasible in a large surface transportation network) (Buhl et al., 2006). In non-planar networks, this measure is also known in Transport Geography as the Alpha Index. The Alpha for the connected network above is 0.4 and for the dendritic network, it is just 0.03. For large networks, Beta and Alpha are highly correlated. Xie and Levinson (2007) developed another useful metric called Treeness. Instead of counting the number of cycles, Treeness is instead calculated by dividing the length of street segments not within a cycle by the total length of street segments. The Treeness measure also provides a value between 0 and 1, but in this case, the higher number represents a more treelike or dendritic network (Xie & Levinson, 2007). Networks with good overall connectivity are called integrated networks. Networks with low connectivity are called fractured networks (although fractured networks can still be comprised of connected components). Again, these measures relate to issues of resilience. When a single node failure can significantly erode network functionality, the system is fragile. 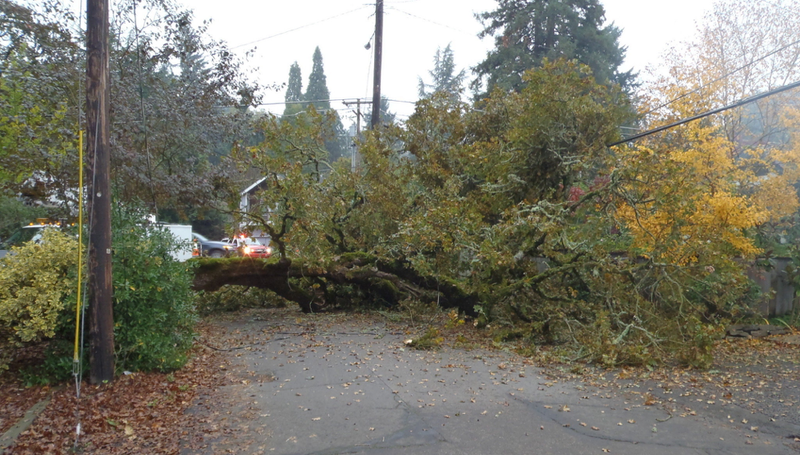 The image below shows a fallen tree in Lake Oswego, OR that cut off more than 50 families from the outside world (or more specifically, the cars of more than 50 households were trapped) (Florip, 2010). If only that network had a little less Treeness.